Tracking jackpots is a great way to quickly and easily see which sites have jackpots that are 'overdue' to pay out. You'll notice that we put the word overdue in inverted commas. Strictly speaking, progressive jackpots don't have a set time or amount when they pay out. If they did, professional gamblers would have figured out a way to ensure that they always win by now. As such, it's impossible to pinpoint when a progressive jackpot is due to be paid. However, that doesn't mean it's not worth using a jackpot tracker. Tracking which sites have a very high jackpot building up can make sure you maximize your win if Lady Luck is on your side. Plus, in the same way that you may use data about past spins to inform your bets when playing roulette, many gamblers like to use data about past jackpot payouts to inform where they play...even if there isn't a huge amount of scientific value in doing so. In the online casino world, Mega Moolah is known as the daddy of progressive jackpot slots since its release in 2008. Regularly boasting the biggest online slot machine prizes in the industry, Mega Moolah is now the go-to choice for spinners of all persuasions. In fact, because Mega Moolah is available in both desktop and mobile form, it's possible to ante-up and win in excess of C$1 million anywhere and at any time. One of the most appealing aspects of Mega Moolah is that it has a 95% Return to Player (RTP) rate. In simple English, this means that every time you spin the reels, you, theoretically, have a 95% chance of earning a return on your investment. Anyone with an understanding of probability will tell you that this ratio represents a fantastic win rate; moreover, when you factor in that one of these wins could be more than C$1 million it represents a great option for everyone. To join this club and play for C$1 million+, simply ante-up on Mega Moolah today. In the online casino world, progressive jackpot slots are games that have an ever-increasing top prize. 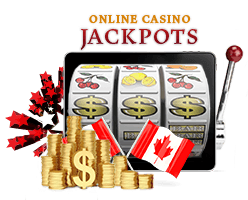 Based on the principle of collaborative effort, these online slots often have jackpots that can reach way beyond the C$1 million mark. At a basic level, progressive jackpot slot machines connect hundreds of players to the same game via a network of portals. Using this connection, the software then takes a small piece of each player's wager and adds it to the jackpot. This network then has a cumulative effect on the top prize and, as more people ante-up, the top prize increases. Over time this means jackpots can reach seven-figure sums and beyond. One of the main benefits of playing progressive jackpot slots online is that you can win a huge amount of money for a comparatively small bet. By aligning the correct symbols in the correct order, it's possible to unlock a progressive jackpot of C$1 million+ by spending as little as C$0.10. Top prizes regularly exceed C$1 million. The jackpot is constantly increasing, but the cost to play doesn't. Betting takes place from C$0.01 per spin. Winning a progressive jackpot can cost as little as C$0.10. Progressive jackpots sit alongside a plethora of additional prizes. Want to know where the biggest progressive jackpots are? We track the biggest slot jackpots here so you know where to find the biggest wins. Are progressive jackpots worth your time?, If you want to be a millionaire they are! While they are notoriously difficult to win, they do actually get won. And when they do the payouts are huge. Do be aware that you may have to satisfy specific betting requirements in order to claim the jackpot. For example, you may have to use the "maximum bet" button for the slot machine. while that means you'll wager more on every bet, the result could be a real boost to your bank balance. Can jackpots ever really be overdue to hit? Under the broad umbrella of 'progressive slots', there's a huge range of games with different numbers of reels and paylines, different max bets and so on. As well as taking all this into account, look for a game with a bonus round that appeals to you - free spins, double or nothing, multipliers and more wilds are just a few of the features you'll come across to help you extend your bankroll. You probably already know the bad news - when it comes to slot machines, online or in a Canadian land-based casino, there's not much in the way of strategy you can employ. Still, compared to other games, slots are cheap and easy to play. Plus, you could stand to make a huge profit if you do get lucky. Some progressive machines will limit the number of consecutive spins you can make. If you get too hungry for that big progressive jackpot and hit your max very quickly, you might end up missing out because you were impatient. That would definitely be a tough thing to live with, so don't be afraid to take it slow. Also, you may want to check the max payout of any casino you visit. Although most online casinos will have a maximum monthly withdrawal, progressive jackpot winnings are usually an exception to the rule. However, some less reputable casinos might leave that clause out, leaving you unable to withdraw your full winnings. Progressive slots are a great way to have some fun and kill some time. And, if you stick with one of the casinos listed on our jackpot tracker, there'll always be the real possibility of you winning a life-changing amount of money. Many gamblers steer clear of slot machines, seeing them as a time sink that relies on good luck and nothing more. If you've found your way to this page, chances are you agree with us that there's a little more to playing slots than that. True, you'll need a little luck, but the huge progressive jackpots associated with online slots definitely make it worth taking a few spins.